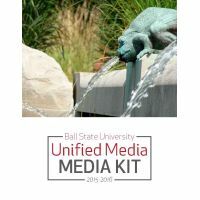 Unified Media is a collaboration of student media organizations at Ball State University. The students who work in the Unified Media Advertising and Creative Suite media organization are able to offer clients a suite of products in an integrated portfolio. This integrated approach unifies the client’s brand and makes it easier to effectively promote, sell and buy. Students are taught how to interpret analytical data to provide a return on investment to their clients. Unified Media Advertising and Creative Suite offers advertising and marketing solutions for print, web and mobile including The Daily News, Ball State Daily.Com, Ball State Daily Mobile, Ball Bearings Magazine and NewsLink Indiana. In addition, we offer print and mobile classified advertising as well as a Housing Guide to help students find rental housing and apartments on and around the Ball State campus and in the Muncie area. We also offer a Dining Guide, also both online and mobile, to help students and faculty find and learn about Muncie and Ball State-area restaurants, bars and cafes.